Les Deux Terroirs is the dream and reality of one Alexandre Sirech, who was formerly in the rum trade. He found wine more challenging and landed in one of the most challenging areas in the world, Bordeaux. Deux Terroirs literally translates to "two soils" which very simply explains that the grapes came from two places. Both places are within the same appellation, Entre-Deux-Mers, which means "between two seas" or rivers, those being the Garonne and the Dordogne. White Bordeaux is a rarity. After all, it only makes up roughly 10% of the appellation's wine production. Bordeaux actually produces more dessert wine, like Sauternes, than white. That may explain why the white wines are so good. The producers have something to prove - and most have proven it splendidly. Our selection is blessed with 55% Sauvignon Blanc, 20% Colombard, 13% Gros Mensang and 12% Ugni Blanc. This combination is unique here, as Gros Mensang and Ugni Blanc are the main grapes further South - but there is no reason they can't shine here. Obviously, they do. 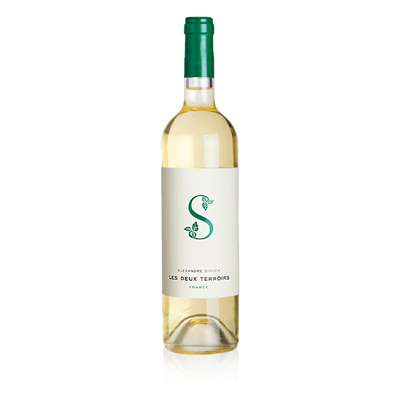 Sauvignon Blanc provides the backbone and acidity while the other three lend delicacy and nuance to the blend, making the whole much greater than the sum of its parts - and the parts are spectacular to begin with. The ensemble presents layers of flavors and textures, beginning with a peach and guava nose, on to the rich peach and citrus palate, and ending with blast of all of them together in a stunning finish.